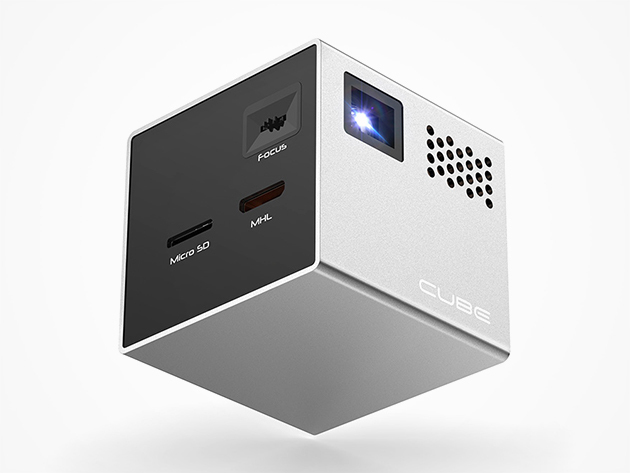 Make a big impression with the little 2-inch-cubed RIF6 Cube Projector. It's super lightweight and made to use anywhere. With just the Cube and your MHL/HDMI devices (like your smartphone or laptop), you can transform your 5-inch screen into a 120-inch display to stream movies, show presentations and slide shows, or play games. It has a built-in speaker and LED light source that lasts up to 20,000 hours. It is available in the Techdirt Deals Store for $249 and comes with a flexible tripod, remote control, charger and various cables for connecting your devices. You WONT be projecting a 120" screen with this projector! If you DO, it will be incredibly dim and neigh unwatchable. More likely you will stick to a 50" or smaller image size. There are downsides to bright projectors, such as HEAT. Mine puts out something on the order of a thousand watts and will noticeably heat up a small room. There's no way to turn down the intensity, other than perhaps buying a lower-wattage bulb (assuming that one was ever made) though bulbs were always very expensive back when they were still being sold. Another big annoyance was fan noise. If you decide to buy a projector, make sure you buy at least one extra bulb with it. Otherwise you can easily wind up with an expensive paperweight. Re: Re: Don't believe the hype! It's a LED bulb so it should last a lot longer, use less power and not get quite so hot as a normal light bulb. But I see no 120" picture with this tiny thing without a pretty dim picture. "...you can transform your 5-inch screen into a 120-inch display to stream movies,..."
By the way, just looking over at A and they had a small projector called the iDGLAX iDG-787 that is currently on sale for $85.95. Rated 4.5 stars. While this CUBE is rated at 50 lumens, the iDGLAX is rated at 300 lumens. Both have a 20,000 LED bulb life which they say is around 14 years of use. It's a little larger. But the Cube can run on it's battery for 90 minutes, I assume that's why the LUMENS rating is so low, the other you have to plug in. No battery that I can see. So what is more important to you? To me, 90 minutes isn't very long, but for some that may be enough. The CUBE price is cheaper here. Like always check around before buying anything and see if it's the right price and option for you. Remember the Mac Cube? Ya, ended up not being very good. Is Cube shape really the design choice to go for? Would like to get a nice 4K projector. It's really the only way to go if you want 4K. These 50, 60,70" 4K display's are a waste. To small for 4K, you need 100"+ Anything smaller, 1080P is just fine. 4K is what you're watching at a Movie Theater. A small 60" screen is not cutting it. So to get a reasonable price to get the needed screen size, a Projector is the only practical way to go.